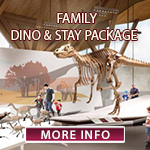 Looking for a place to stay while you explore our museum? We have you covered! A great package is currently being offered in partnership with Podollan Inn & Spa. Click on our link to know more! Follow the links below for more amazing deals at local hotels!